Everyone who has bought a home knows that an official inspection is no guarantee against unpleasant surprises, and that, ultimately, the burden to ask the important questions about the physical aspects of a home is on the home buyer. But buying a home is one of life's most stressful, emotionally fraught activities, and it's easy to see why many home buyers fail to anticipate the kinds of exasperating and expensive problems that can crop up after closing. 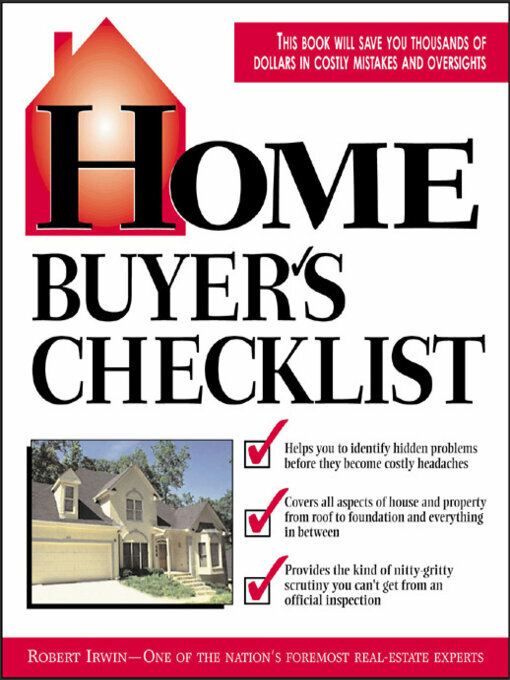 Written by bestselling real estate author (more than 1 million books sold) Robert Irwin, Home Buyer's Checklist levels the playing field by equipping home buyers with a comprehensive list of questions pertaining to all the physical aspects of a house that may not be covered in an official inspection. From basement to attic, pantry to lawn, Bob walks readers through every room, nook, cranny, closet and keep, asking important questions about windows, screens, doors and door frames, fireplaces, light fixtures, moldings, and much, much more. And, drawing upon his many years of experience in the business, he provides pointers on how to deal with each problem, including information on how much it will cost to fix, how to estimate its short- and long-term consequences, how it should impact on the negotiating process, and more.